Glenda Campos recently moved from the Seattle area to Orange County, as her husband’s job with Boeing was relocated to Seal Beach. 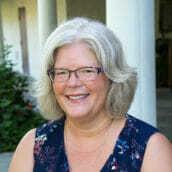 Her degree in Elementary Education and Language Arts from Seattle Pacific University launched her teaching career in 1985. Mrs. Campos holds a California Clear Credential in multiple subjects and English. Her rich and varied experience, ranging from 1st-12th grade, private, public and the home school environment, from classroom teaching to small group work, reaching the highly capable students and supporting the struggling learners, as well as supervising and mentoring teachers uniquely equips Mrs. Campos for the Arbor Learning Community. She homeschooled her daughter through most of her 12 years and her son, too, as it best fit his needs. She lives with her husband and son in West Garden Grove. With her daughter at UCLA and her son in high school, she’s glad to be teaching again. Throughout her career, the teaching of writing, art and literature brought her great joy. With eager anticipation she’s looking forward to working with students at The Arbor Learning Community.